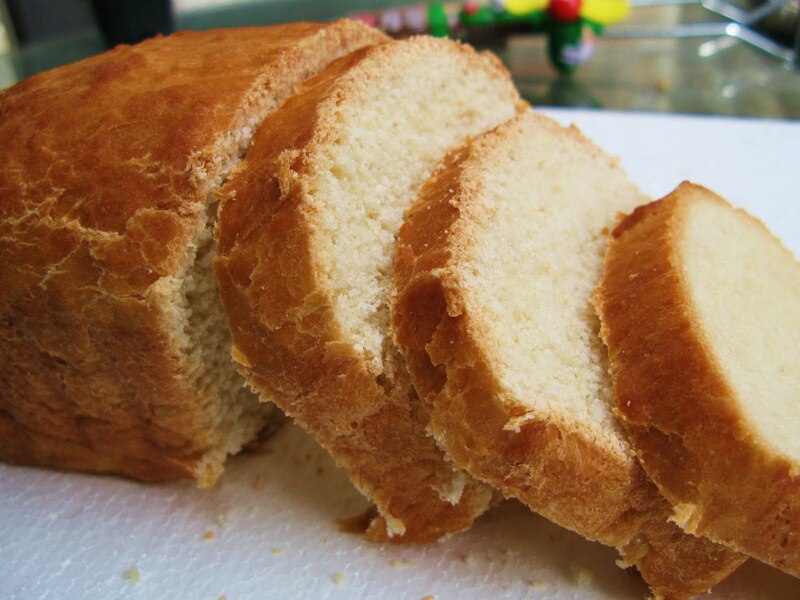 This white bread variation makes a wonderful sandwich bread with just a hint of Amish Friendship Bread sweetness. This recipe and accompanying photos are courtesy Kitchen Friend May Naing from the food blog, Made With Love. Oil bottom and sides of a large bowl. Put dough into bowl and cover lightly. Let dough stand overnight at room temperature. In the morning, punch dough down four or five times. Divide dough into three equal balls. Kneed each ball eight to ten times. Grease and dust three loaf pans with flour. Brush tops with oil and cover with oiled foil. Let stand 4-5 hours or all day. Bake 30-40 minutes and cover with foil after lightly browned. This dough can be mixed with a Kitchen Aid mixer or by hand. If dough has not risen well on the second rise, put a small pan of water on the bottom rack in the oven, heat to 200° F (93° C) and then turn it off. Put dough on top rack for 1-2 hours to get a good rise. I have found that I have to take extra care to help this bread rise. It takes twice as long, and I usually place the bowl/loaf pans on a heating pad to keep it going, but it is well worth the wait. I will say that this bread lasts forever! I kept it on the counter in a twist and tie plastic bag and it was good for almost a month! I was floored! I noticed a similar occurrence when I moved. I’ve made this recipe before without trouble and I think it has to do with oven type, at least in my case. Before when I baked I used a gas oven. Now I have an electric one. I’ve noticed things don’t cook as evenly, so your problem of the middle not cooking may be related. I switch to the very middle rack with electic & that seems to help. You can also try cooking for longer at a slightly lower temp (325 or 300). This has helped me with the same problem. Good Luck! Can you use a different flour??? Hi Angie! It’s not recommended. You can always experiment, though, and if you end up with good results (or even not so good results), please share so we can all learn! why can you use a mixer (assuming means the dough hook)? thought only non metallic utensils should be used with starter? You don’t want to use any raw metal, like uncoated aluminum, but almost every new appliance or baking sheet, etc is nonstick or treated. If you have your grandma’s old baking tins, or baking tins with scratches on them, you’ll see that the starter interacts with the metals and causes discoloration and can affect the taste of the bread. Hope this helps, Marty!